Sherry"s Stamped Treasures: Want Summer Mini Product at 30% Off? Want Summer Mini Product at 30% Off? You're probably wondering about my title! Your thinking the Summer Mini hasn't even been released yet - how can I get product, not yet released, at 30% off? One of the things I love about being a demonstrator is that we get sneak peeks and the opportunity to preorder product before it's available to everyone else. I have seen the Summer Mini and there are some fabulous new must have products in there! Did you know that when you sign up to be a demonstrator you can get 30% off your first qualifying order? You could combine this with a preorder from the Summer Mini on April 1st and save! 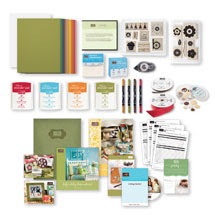 Plus if you purchase the starter kit before the end of March, during Sale-A-Bration, you can get your starter kit for 15% off, and add on any stamp set from the Idea Book & Catalogue for FREE ($63.95 value). Have some questions about becoming a demonstrator? I'd be happy to answer them for you, no matter where you are located, I welcome anyone across Canada to the Treasure Stampers Team. I can answer your questions by email, in person or by phone (780-467-7499). You can also find out more on the FAQ's page here. There are so many benefits to becoming a demonstrator - the preorder is just one of them. I'd love to share this wonderful opportunity, that has changed my life, with you! If you'd like to see what comes in the starter kit check out this post. What have you got to loose? If the time is right for you and you would like to join, you can do so online by clicking Join Now - the authorization code is SHPKSTAMPER.